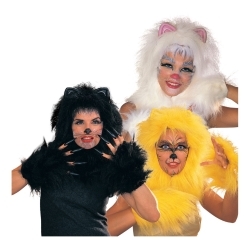 These cat accessory kits are perfect for directors who are creating costumes for the cast of “Cats” or just as a base to start putting together you own custom cat costume. The cat accessory kits are available in black, gold, or white and include a plush cat headpiece and matching furry hand mitts. Add whiskers and some makeup to complete the look!